You don't often see wooden drinking fountains. Wood rots, falls apart, gets weird. 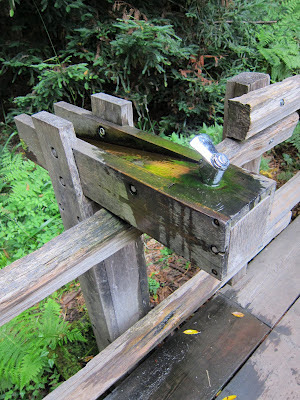 But this drinking fountain in Muir Woods makes everyone look foolish for eschewing the wooden drinking fountain. The beauty of the moss or algae shines against the wet wood, and the simple design drops the excess water right into the adjacent woodland. I don't even mind that some water drips off the side-- why are you in the woods anyway? Don't you want to feel some water on your skin to go along with the feel of the breeze and the echos of the birds? It's a truly beautiful design, and fits right into its forest home.